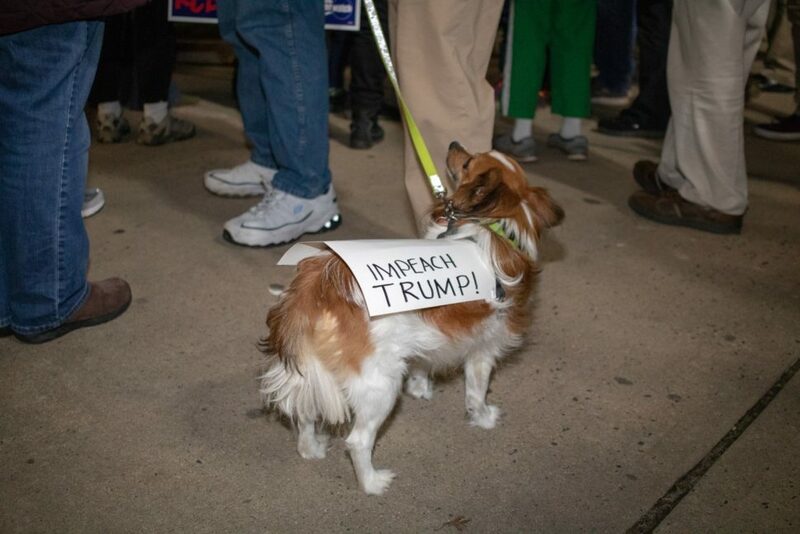 On Thursday 11/8/18 over 100,000 American citizens banded together to demand that the Mueller investigation not to be interfered with. 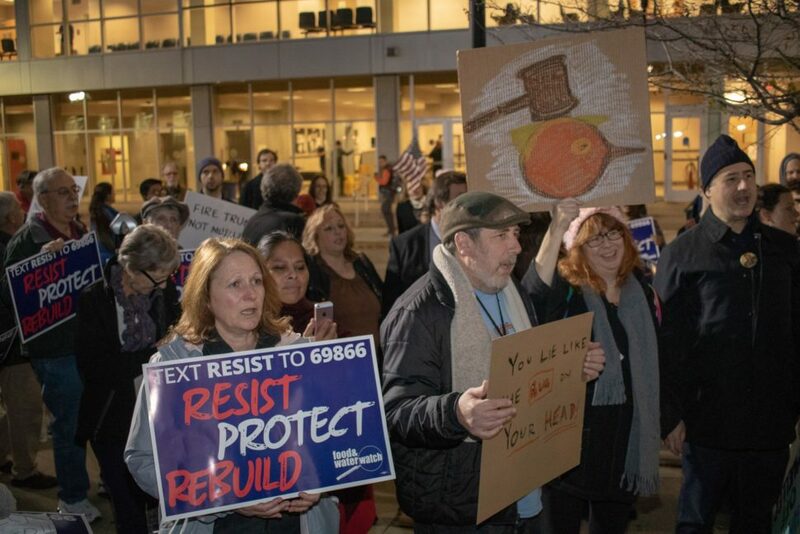 We organized the local rapid response rally in New Brunswick, NJ in collaboration with MoveOn.org. With less than 20 hours of working time, we were able to mobilize 150 community members to come together in defense of our democracy. There may be a need for future rapid response rallies, and I wanted to share my strategy and lessons learned from organizing the rally in the hope that it may help you in the future. When choosing your location, it’s important to keep your focus on the convenience and access of your potential attendees. Rapid response rallies don’t have the luxury of being a consistent block of time in your community members’ schedules, so we want to make sure that getting to your rally is easy. Ideally, you will want to book your rally in a highly populated area, so your total pool of possible participants is large, giving you a better chance for last-minute attendees. We registered to organize our rapid response rally at the City Hall in New Brunswick NJ, a city with ~57,000  people. It’s home to mega-corporations such as Johnson & Johnson and Rutgers University, our largest state University. Don’t be disheartened if your location has a small population, many rallies doubled or even tripled our attendance with many less available people! Include a link to the city’s parking guide in your event information and the emails that you will be sending out to participants. Parking in New Brunswick can be challenging, but I was fortunate that the city had a parking resource available . If your local government doesn’t have a parking resource, you could use Google Maps and drop some pins in areas that you would suggest attendees park. Getting your community to the rally location as smoothly as possible will ensure that their energy is focused on the task at hand and avoid complaints about your site. The next step is to speak with the city administration and police department. Contact them well in advance of the actual rally. Because your rapid response rally will not have a set date and time it is unlikely that you will be able to get a permit for your event as was the case with our rally. We worked closely with a detective from the New Brunswick Police Department who was the first person I called when the rally fired. Taking time to create a day-of plan was the best investment of time we made during our preparation phase. You can view the original notes here. It was the first thing printed out when word was received that the rally had triggered and was used as a checklist throughout the day. Preparing an actionable list of tasks to be completed the day of your rally will reduce anxiety and empower you to focus on the tasks at hand. Not linked here is a list of press contacts that a friend shared with us, it made it simple to get the message out immediately. I’d recommend taking time to find your local contacts upon registering your rapid response rally. This way you can avoid researching during the scramble of rally day. We received press coverage from multiple organizations and were thankful for it. Press is an important part of your rally. It does not define your success, but it does give your actions visibility which is essential. There are many Americans who believe in the movement despite being unable or willing to attend your rapid response rally; press helps them know that they are not alone in their desire to transcend our present circumstances. If you’re like most people and work a job with a structured time requirement we recommend letting your superior know well ahead of time that in the future you may need to take a sudden day off in the future. Be sure to document as well, a casual email confirming the conversation and your request for a future vacation day would suffice. There will never be a convenient time for a rapid response rally. 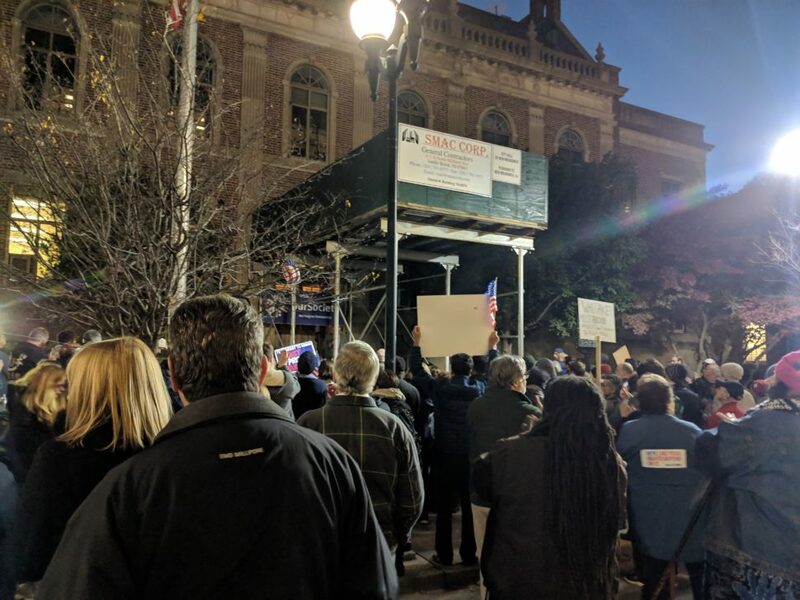 When the #NotAboveTheLaw rally fired, some organizers were expressing frustration about the timing since the rallies triggered the day after the midterm elections. The truth is that more than likely you won’t be happy with when the rally launches, but that doesn’t matter. Be present, be focused, and bring your energy to empowering your community in a time of need. When planning how our rally would function, I consulted with Sarah Kelly, a veteran organizer, and director at OurSociety. We agreed that we wanted to have speakers in attendance to provide additional value to our attendees. Understanding that our rapid response rally would force people to make an impulsive decision to attend we concluded that a short, focused event with speakers would be our best path to success. Our speakers were a blend of local community leaders and activists. If you are unfamiliar with people active in your community take time to reach out to them during the rally planning stage. Local council members, mayors, people you see active in community-based causes, and of course you – by the time your rally fires you’ll officially be an organizer! Since it is certain that a rapid response rally will occur suddenly, we recommend having many potential options as some people will be unable to help. 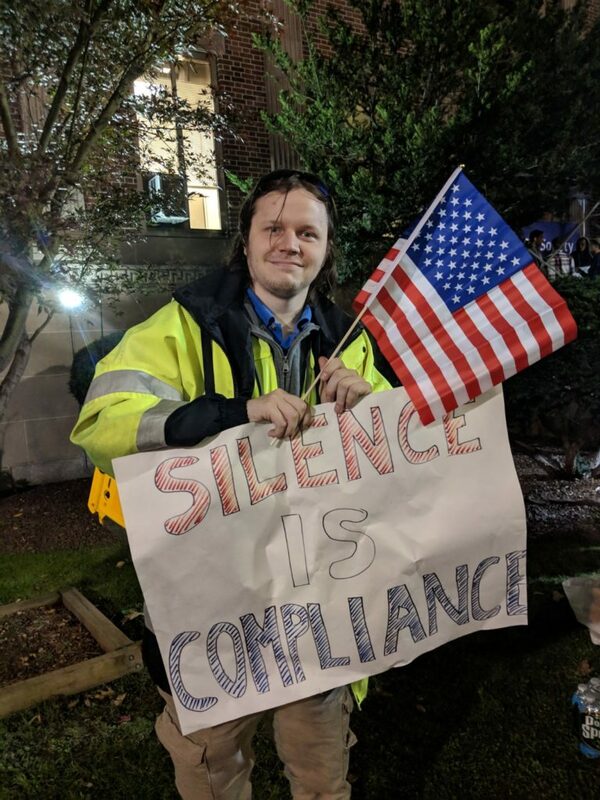 We asked our speakers to keep the length of their talks to no more than seven minutes and to stay focused on the theme of “No One Is Above the Law.” This way we were offering real value to the rally attendees while respecting their time. 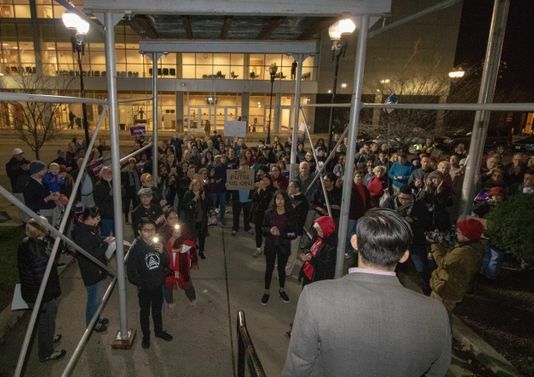 Our vision was that if our rally attendees enjoyed the experience without feeling overwhelmed, we would lay the foundation for future civic participation when the need arose. Don’t be afraid to set guidelines for your speakers, even if they’re more experienced than you. It is helpful to them and ensures that your community activists are engaging in a consistent and positive experience. Our event timeline was to allow people to mingle for ten to fifteen minutes, delegate chant leaders to energize the attendees for another ten minutes, and then begin with the speakers. We recommend that you as the organizer act as the MC for the evening, welcoming everyone, introducing the speakers, and ending with some words of your own. Ask your speakers for brief biographies ahead of time and make sure that you conclude with the demands of your rally so that everyone leaves with a clear understanding of why they were rallying. Do your best set aside an hour to review what you are going to say; it will be better for you and the rally attendees if you’re comfortable. Overall our entire event lasted an hour which we thought was appropriate given the circumstances of our attendees. When you receive your email or text that your rapid response rally has triggered the first thing you should do is take a deep breath. If you’ve followed this guide so far you already have a long list of things to do; now you need to do them. Your optimal workplace will be an environment where you feel comfortable and can focus without interruption. Keep your registered rally attendees informed. We sent three emails that day with updated status and requests for support during the event. It was because of those emails that we were able to connect with the Highland Park NJ Reformed Church who graciously lent us their speaker and microphone system. Numerous rally goers brought water, snacks, signs and sign-making supplies, while we provided sodas and candy. You’re going to want to have a table at the event to provide information to your attendees. If you’re part of an organization involved in the progress of society consider making them the official sponsor of the event as we did. You can provide information about your organization’s purpose and efforts to share with the community. If you’re organizing your rally independently, there is still a lot of material you can access and provide. We brought voter registration forms, information about our organization, a sign in sheet with email collection, and displayed information about other organizations attending the event. Voter registration forms can be grabbed well ahead of time, and you can include a line in your event details offering space for other civic action groups to share their work. Your community members will appreciate the ability to learn more and connect with others who care about improving society. Don’t stress if your rally begins and you realize you’ve forgotten things. About twenty minutes before the rally started we realized we had forgotten to print out the rally chants!. It’s likely that your attendees will own smartphones and be able to look up the chants independently. We delegated chant leadership to our attendees, and they did a phenomenal job. The morning of the rally I kept my normal Thursday routine. I took my wife Tressa to work. I took my dog for a run, meditated, had coffee and read for a bit. Coordinating the rally was going to be demanding so I wanted to make sure that I was in a peaceful place where I could focus intensely on the present. I believed that our community was going to make this a successful rally and they did. Coordinating your rapid response rally is a challenging task but one that I strongly recommend. It was a great experience, and the reward of connecting deeper with my community members far exceeded the time that was invested in the facilitation of the day. Democracy is a tool that requires time and energy to be effective for the people. Your help in rapid mobilization rallies will send a clear message that many Americans are waking up to the misgivings of our elected representation. Together we have an opportunity to transform society and rally organizers like you are leading the charge.